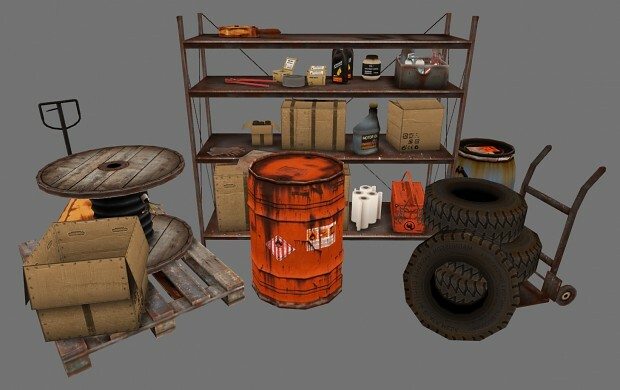 Awesome props, will steal it later :) you had plained to add new weapons or enemys? I dont have planned new weapons yet, but maybe some modifications of existing enemys. Furthermore the suit will get some new fancy features. Well, my suggestion is to transfer your art style onto the existing weapon arsenal then. I guess, that would give the game a nice touch. Realy kewl work so far..You may wanna play some paranoia for some prop insipiration..
On the other hand, the props look great, but I'd like to see more mapping. You can make a prop when you need it, instead of planning every single prop and making it in the beginning. Fantastic looking props for sure, the composition here is so natural and feels real. They remind me of props from F.E.A.R., they have about the same detail too, don't look anything like the detail you'd find in GS normally.. you've done an immense job! Storage room ensemble for the win.